When U.S. Citizenship and Immigration Services is reviewing a petition or application, the adjudication officers reviewing the petition the filing may find a piece of information is missing, that the information provided is insufficient, or they may simply seek to know something not present in the applicant’s materials in order to make a decision. When this circumstance arises, USCIS will issue a Request for Evidence (RFE). Receiving a Request for Evidence can be alarming for a potential employee seeking an employment-based immigrant or nonimmigrant visa. It can be distressing and frustrating for the employer, too. An RFE does not mean that USCIS is preparing to deny the visa. However, it is necessary to promptly comply with the request. If you are an employer sponsoring a person for a visa and that person receives an RFE, or you are the visa applicant who receives one, you don’t have to respond by yourself. A Houston immigration lawyer can help you develop a response in a way most likely to resolve the situation. Kathryn Karam is a skilled attorney who assists people who are seeking visas and receive a Request for Evidence. If you or a potential employee receive an RFE, it does not mean the quest for a visa is over. However, having an experienced hand guide you could made a difference in how the matter is resolved. Call Karam Immigration law today at (832) 582-0620 to set up a consultation. Kathryn Karam helps people and employers throughout the Houston area, including in Bellaire, Alief, Cinco Ranch, Sugar Land, Clear Lake, Kingwood and The Woodlands. When an officer with USCIS is reviewing a visa application, he or she will decide what information he or she needs to make a decision. In some cases, all the necessary information is in the application. However, the officer may feel that more information is needed and can send a Request for Evidence. In some cases, the missing information was simply inadvertently left out of the application. In other cases, the officer may have noticed something about the file and just needs additional information to feel comfortable making a final decision. An experienced employment-based immigration attorney who helps prepare the application can often spot a potential problem before the application is submitted. No matter how small or insignificant a request seems, it is absolutely essential to respond. Failing to timely respond can result in the visa application being denied. In most cases, a person will have between 30 and 90 days to respond. The due date will be stated on the RFE. It is also important to fully and adequately respond. Failure to provide information or documentation sufficient to meet the request can result in delays for the visa processing, or even denial. However, providing more information than needed can unnecessarily complicate matters further by raising even more questions. Your attorney can examine the request, and draft a response that is likely to adequately meet the need for information that the officer is seeking. If you receive an RFE or if your employee receives one, the important thing is to act quickly. Seeking a skilled attorney is an important first step. A request for evidence does not mean your visa application will be denied. With the help of an experienced Houston immigration lawyer, it may only be a small roadbump. 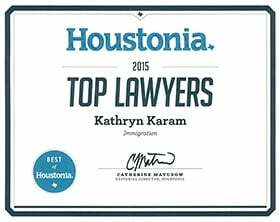 Kathryn Karam has helped many Houston applicants successfully respond to RFEs. Call Karam Immigration law today at (832) 582-0620 to schedule a consultation to discuss how to respond to a Request for Evidence.